For a nation commonly assumed, as much by both its own citizens as foreigners, as being focused on the welfare of the group at the expense of the individual, Japan is the home to an unusually large number of singular gaming geniuses. From Sega’s Yu Suzuki to Nintendo’s Shigeru Miyamoto, successful Japanese games are frequently associated with a single visionary director. Despite the fact modern games are clearly the work of big teams, it’s always suited Sony to fit the PlayStation into this tradition, and all three of its consoles have played host to the work of teams lead by star game directors, such as Hideo Kojima’s Metal Gear Solid games and Kazunori Yamauchi’s Gran Turismo series. One man’s signature bizarre touch has been missing from the PlayStation 3, though - Katamari Damacy’s Keita Takahashi – but now he’s back, with Noby Noby Boy, a download-only title which is available via the PlayStation Network. 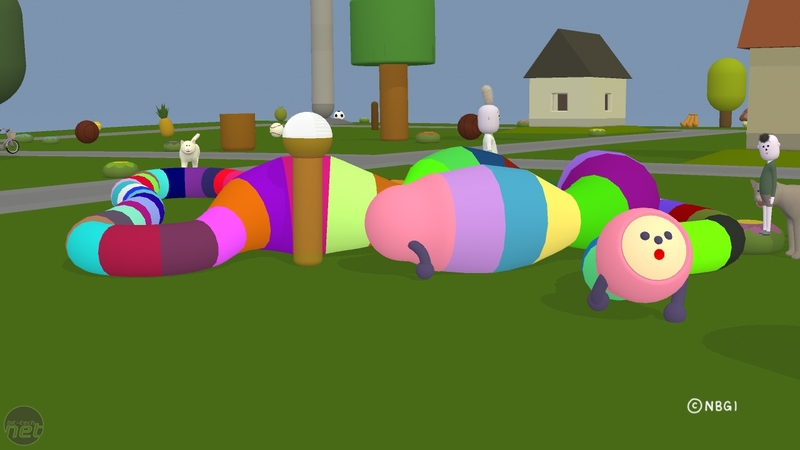 In Noby Noby Boy, you control a weird happy caterpillar chappy called BOY, and your only aim appears to be to grow longer, and let GIRL, another weird caterpillar creature, know how long you’ve grown. And then she can grown longer too, which she needs to do in order to reach the Moon. Along the way, you’ll meet the Space Squirrel, talk to the sun and discover new worlds full of dice, turtles and basketballs. Two things. Firstly, I’m not making this up, and I haven’t been taking anything. You can check Wikipedia if you want. It's all true. Secondly, I suspect you’ve already heard enough to make your mind up about the game. Despite Noby Noby Boy’s cute, naïve looks and non-lethal gameplay it will probably be one of the more divisive games of the year. Some will look at it as a beautiful piece of art that expands the notion that videogames are a more complex and involving form of art than anything else we currently have. Others will take one look at the flat shading, coy terminology and recoil in disgust. Several members of the bit-tech team certainly did when we had Noby Noby Boy running in the labs. As such, the rest of this review is split in two. All you need to do is make your choice, based on how you felt about Katamari Damacy. In a recent discussion Nintendo's Miyamoto said that Ocarina of Time was very nearly an FPS game with guns and everything. Beautiful Katamari has been out for a fair old while in the US and Japan, but it's only just hit European shores. Is the game objectively worth the wait now that the hype has died down, or is this ball reached the bottom of the hill? Confused by Katamari? Dazed by DoA? Stunned by Shenmue? We take a trip through some of the weirdest plotlines ever to grace a computer game and ask - are games developers insane?